Thomas Hardy wrote the tragic novel The Mayor of Casterbrige (1886), setting it in the fictional town Casterbridge which was based on his childhood town Dorchester. Hardy's novel explores the life of a rural hay-trusser, Michael Henchard and his rise and fall in Casterbridge. It was set in 1846, before the Corn Laws, when England was experiencing scientific and technical advancement and new ways of working. In addition, social values were also changing. Hardy is well known for his very pictorial descriptions and was a writer in the realist/naturalist tradition and used real places in Dorchester to describe rural Casterbrige. The functions of Hardy's descriptive language creates a vivid picture; illustrates and reflects the personality of the characters concerned; creates a strong sense of atmosphere often using pathetic fallacy and gives a sense of social history. Throughout the novel, Hardy describes many exterior settings such as Casterbridge and its surrounding area including Weydon Priors, The Ring and the market-place. Interior settings include Henchard and Lucetta's home and the three public houses, the King's Arms, the Three Mariners and Peter's Finger. 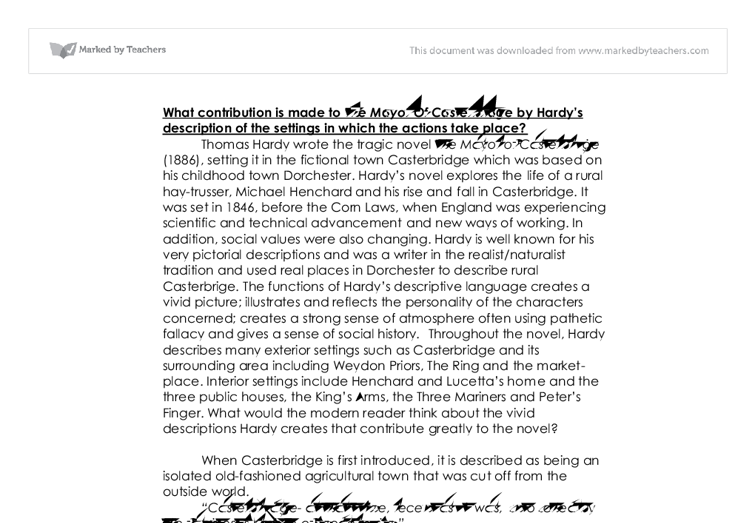 What would the modern reader think about the vivid descriptions Hardy creates that contribute greatly to the novel? ...read more. "It looked Roman, bespoke the art of Rome, concealed dead men of Rome." This location is filled with a lot of secrecy, privacy and where some of the key events in the novel take place, when Henchard is reunited with Susan after their long absence and when he meets Lucetta returning from Jersey. The atmosphere of The Ring has a negative impact as this is where violent fights and deaths would take place in Roman times as it used to be used by the gladiators and for public executions. This contributes to the sense of inevitable doom and eventual death of Henchard. As well as the exterior settings that Hardy intensely describes throughout the novel he also includes a range of interior settings such as Lucetta's home and the three inns Hardy uses to show class divisions within society in Victorian England. The King's Arms, the gathering place for higher class citizens play an important setting. At the beginning of the novel we meet the wealthy Henchard here, when Susan and Elizabeth-Jane return to find him. "The interior of the hotel dining room was spread out before her, with its tables, and glass, and plate, and inmates." ...read more. The description builds a personality for one of the main characters and illustrates what women were expected to be like in former years. Hardy shows how Casterbridge is being influenced by outside factors. The young reader may consider The Mayor of Casterbridge to be a long winded novel with endless amounts of description that could be considered to be too excessive. Nevertheless the descriptions contribute to the novel by adding a vivid picture, exemplifying character's personalities, creating a strong sense of atmosphere and using pathetic fallacy and giving a sense of social history. Hardy creates a genuine and believable world for the characters by setting it in an existing town that he could relate it to. The descriptions in the novel are vital and without it, The Mayor of Casterbridge would be no different to other novels. Hardy is able to create bonds with the reader and the characters in the book by using description to demonstrate their personality, for example Lucetta's house and use different settings for different classes of people - the three public houses. The exterior settings give the novel an overview of the time period for example the detailed descriptions of Casterbridge, which makes the reader's ability to associate with the novel stronger. ?? ?? ?? ?? What contribution is made to The Mayor Of Casterbridge by Hardy's description of the settings in which the actions take place? Jagjoth Vasir ...read more. 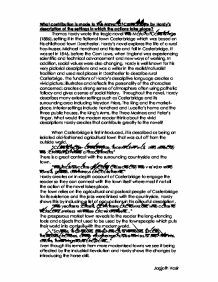 This student written piece of work is one of many that can be found in our GCSE The Mayor of Casterbridge section. The first was Susan who had aged significantly and now was an old women of about 40 whose "skin had undergone textural change" demonstrating the number of years that had passed. The other was Elizabeth-Jane who was now of a similar age to Susan when she'd last walked along the road. However, when Farfrae was at Henchard's store, he lightly mentioned what has and will trouble Henchard for much longer: "Should a man turrun against fate?" As Henchard's dealings with Farfrae grew stronger and more frequent, Henchard began to unmask his true feelings and unlock stories of the past. Henchard seems more interested in Elizabeth Jane having her surname changed "You'll take my surname now - hey" than the welfare of his daughter, again showing a very self-centered side of Henchard. After Henchard opens the letter from Susan he realises that he has been too hasty but keeps the letter safe and decides not to tell Elizabeth Jane. However, towards the end, he is crippled by the events that took place in the furmity-woman's tent; he sets out to punish himself again and again. He ends up losing his daughter, EJ for his deceitful lies and saying that Newson dies. Other faults in Henchard's temperament include his egotism, a touch of vindictiveness, jealousy, and low self-esteem at times. His arrogance, along with his bad temper, is displayed at times; Abel Whittle, for example, who is consistently late for work is made to go to work wearing nothing but his underwear.